Viewers of the Fox Television temporary hit series Sleepy Hollow follow a story very loosely based on one of America’s first hits in the world of literary fiction, penned by the Hudson valley writer Washington Irving. The TV show is set in the Tarrytown, New York area (dismissing by default Kinderhook, New York’s claim to be the setting of Irving’s story). It even has a character named “Frank Irving”, giving a nod to the 19th century originator of this fantasy. The TV show requires enormous suspension of disbelief; mine is always ruined by the Spanish moss draped trees of the show’s shooting locations (and not exactly renewed by the long aerial shots of the lower Hudson estuary shown during scene changes). My sense is that Irving (born in 1783, at the end of the American Revolution) was keenly aware of the passing of yesterday’s world and the arrival of a new one. The on-going social tension of this process seems evident in the “Legend of Sleepy Hollow” where a school-teaching ethnic English newcomer, Ichabod Crane, tries to settle into a rural New York Dutch community, only to be challenged by a bully with a long, local bloodline. Irving gives us another take on out-with-the-old, in-with-the-new through “Rip Van Winkle” (also in The Sketchbook), which lets the reader feel how startling it would be to fall asleep in a quiet, Hudson valley corner of the British Empire and awaken 20 years later in the undreamed of American republic. With regard to the Bracebridge Hall Christmas stories, it seem that in a world that had literature and writers but no ethnography, Irving presciently assumes the 19th century ethnographer’s task of rescuing ancient traditions before they could disappear. In the third chapter, “Christmas Eve”, the narrator arrives at Bracebridge Hall under the moonlight, to the barking of dogs. He enters a world in which the old English customs are not only celebrated, but enforced by old Mr. Bracebridge (often referred to as “the squire”). The squire is tolerant enough to allow the introduction of tea and toast to the traditional meat and beer-heavy breakfast (in the next chapter) but not enough to allow singing in French (in this one). On Christmas Eve the yule log (referred to as the “Yule clog”) blazed; this is a custom discussed in some detail. The north of England was the Yule log’s stronghold as customs changed or died out. 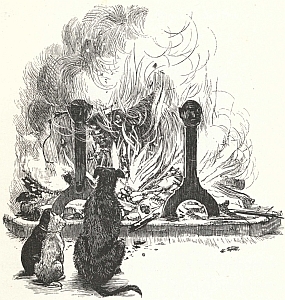 The yule fire was the scene of “drinking, singing, and telling of tales”. But it could be attended by bad luck if the fire went out during the night, or if a barefoot or squinty-eyed guests arrived. After a few more semi-scary verses, the singer delivers his heart-felt message: “Then, Julia, let me woo thee”. And the woman named Julia did everything but notice. For the purpose of the song, these are the words spoken for this occasion by a tenant farmer and Christmas guest to his landlord and host, as celebrated in verse by the landlord and host. The landlord, Mr. Bracebridge, followed the old injunction to feast his neighbors: “At Christmas be merry and thankful withal, and feast thy poor neighbors, the great and the small.” After church, the hall was opened to the neighbors for Christmas festivities, with beer, food, and games. 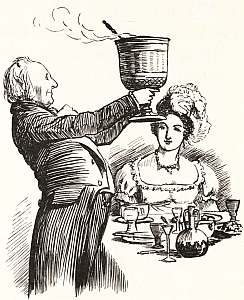 The traditional delicacies of the Christmas feast include a boar’s head and peacock (although in this story peacock is not served as the year had been hard on the peacocks). Serving the boar’s head, replete with its own Christmas carol, is an old custom the squire had preserved at home (it reminded him fondly of his college days). Wassail was served as well. We learn that wassail could be made from ale instead of wine; that it might be spiced with a variety of things including nutmeg, ginger, sugar, toast, and roasted crabs; and at one time it was served in a bowl passed between the drinkers, although by the writer’s era it was drunk from individual cups. After dinner a considerable period of drinking and story-telling ensued, perhaps to the extent of infringing upon wakefulness and sobriety. Not to worry, though: the manor house was about to explode with mirth and romping, as one particular adult, gone into character as the Lord of Misrule, led a ragged tag-like game for children clothed in customs designed from the garments of the manor family’s ancestors, dragged out of storage for the occasion. And for the satisfaction of readers who don’t think history is very important, what was the point of telling this Christmas story? For the pleasure of reading it, the author asserts, in case it will “in these days of evil, rub out one wrinkle from the brow of care, or beguile the heavy heart of one moment of sorrow”. The point is to make the reader “more in good humor.” And so these stories come recommended. Merry Christmas!